Neal Lancaster wanted to gain practical knowledge about how the Mississippi Legislature functions. 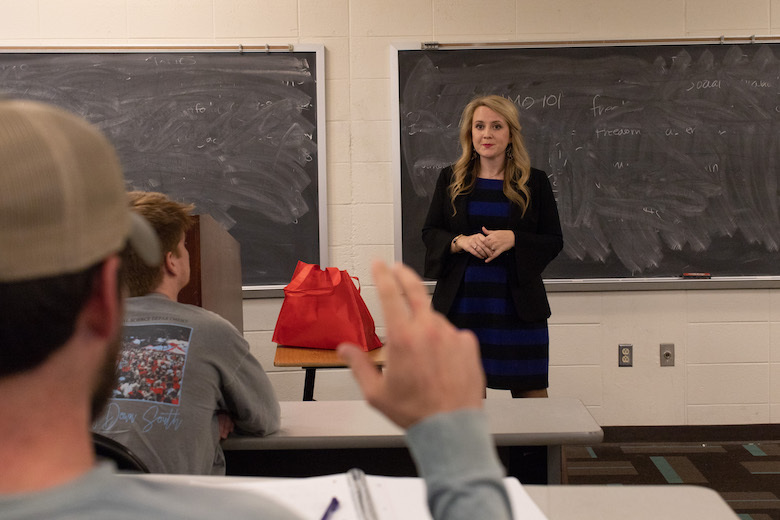 And thanks to an immersive University of Mississippi political science course aimed at preparing future state legislators, that’s what Lancaster is getting. The senior political science major from Corinth is among 18 Ole Miss students enrolled in POL 399: Model Mississippi State Legislature. The course offers participants an opportunity to expand their understanding and deepen their appreciation of the state legislative process. Divided into two components, the course includes a student-led simulation based on the Mississippi Senate in which students research, write and debate legislation. It also allows them to meet and listen to guest speakers from state agencies/departments whose work is relevant to the legislative process. Sue Ann Skipworth, instructional assistant professor of political science, divides the students into the finance and education committees. During the committee phase, the students discuss new potential ideas and rule out old ones, only to come full circle back to the old ideas after further debate. While Skipworth does advise on certain issues, the whole process is essentially self-guided by the students. This semester, Lancaster and his classmates met with guest speakers Liz Welch, secretary of the Mississippi Senate; Emelia Nordan, college savings plans and policy director of the Office of the State Treasurer; and David Pray, evaluation division manager at the Mississippi Legislative PEER Committee. Meeting and discussing issues with the administrators has proven invaluable to the students. Nordan said the students have been eager to learn. Welch said she, too, has been impressed with the students’ participation. Skipworth and Welch have discussed having the class visit Jackson for the legislative session, which typically runs from January to April. As state political discussions remain prevalent, Nordan said it’s especially important to expose students to such an important issue like the legislative process. For more information about the UM Department of Political Science, visit http://politicalscience.olemiss.edu/.